Last week I commented that A New Bubble Has Emerged: Complacency. 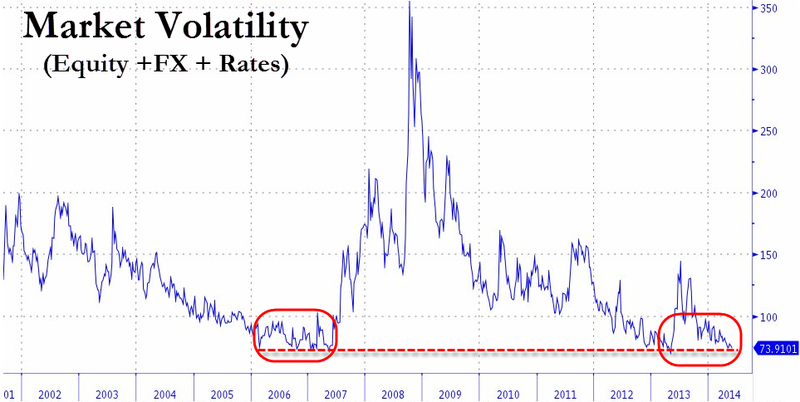 This topic seemed to resonate throughout the week from some of the top minds in finance who are noticing that there is no volatility in asset classes, anywhere. 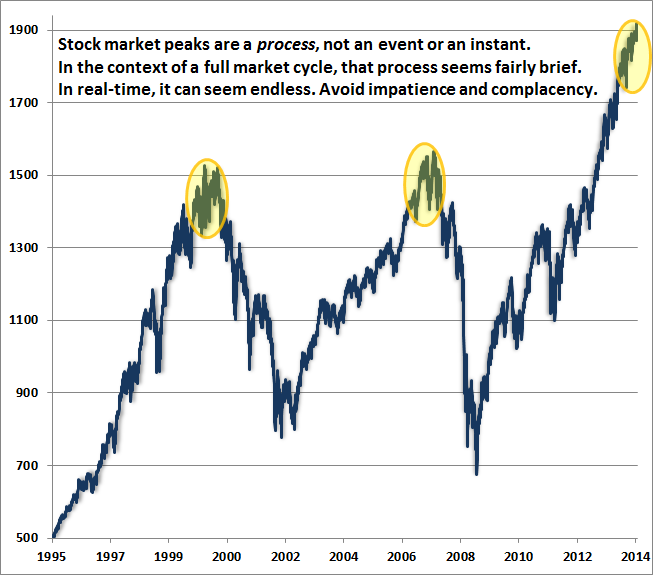 This type of behavior tends to occur at the cyclical peak of market cycles, shown below with the combined (extremely low) volatility in stocks, currencies and bonds. "It’s fascinating how investors come to forget that markets move in cycles and not perpetual diagonal lines. 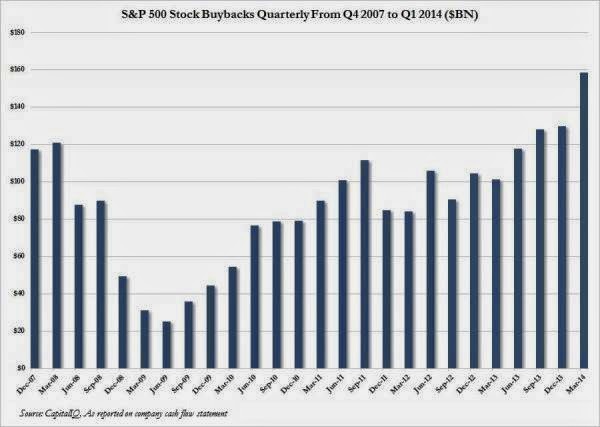 A normal, run-of-the mill cyclical bear market wipes out more than half of the preceding bull market advance." Cyclical market cycles tend to follow a three stage process, which overshoot the long term trend line upward before finally overshooting the long term trend line downward. During the final stage of a cyclical rally you end up at a point where participants believe that the market cannot fall. Everyone has forgotten the last downturn, and the bears have gone into hibernation. Who is the big buyer that continues to push the U.S. stock market further into the stratosphere? As Zero Hedge noted this week, it is the companies that make up the S&P 500 which purchased $160 billion of their own stock in the first quarter. "Unlike traditional investors who at least pretend to try to buy low and sell high, companies, who are simply buying back their own stock to reduce their outstanding stock float, have virtually zero cost considerations. The only perogative is to reduce the amount of shares outstanding and make the S in EPS lower, thus boosting the overall fraction in order to beat estimates for one more quarter." You'll note that in March 2009, when stocks represented a tremendous discount in comparison to where prices are today, companies wanted nothing to do with making purchases of their own shares. Today they cannot get enough. It's great to know that stocks are over valued and over loved today by almost any metric in history, but what people really want to know is the day the party is going to end and U.S. stocks will finally return back to earth. Unfortunately, no one can tell you when that will occur. You can either continue to play Russian Roulette with this market and ride the momentum further upward into bubble territory, or you can wait on the sidelines and look foolish with the rest of the rational market participants. With that said, I believe that when this ridiculous party ends it is going to have a very violent conclusion. Given that the 10 30 US Sovereign Debt Yield Curve, $TNX:$TYX, steepened at the end of the week of May 30, 2014, and given that Equity Investments are terrifically overbought, and given that US Government Debt, EDV, TLT, is approaching overbought, the short selling opportunity of a lifetime has arrived. Just as one buys into dips in a bull market one sells into pips in a bear market; for those inclined to trade, now is the time to start short selling. Global Financial Institutions such as Japan’s IX, NMR, Brazil’s BSBR, ITUB, Mexico’s BSMX, India’s IBN, HDB, the UK’s RBS, LYG, Canada’s BNS, TD, CM, BMO, Chile’s BCH, BCA, Spain’s STD, Argentina’s BFR, will be trading strongly lower, leading Nation Investment, EFA, lower, as debt deflation picks up at the hands of the currency traders and the call of the bond vigilantes. Please consider that peak money and peak wealth has been attained and, as presented by the Apostle Paul in Ephesians 1:10, is the culmination of the activity of Jesus Christ in the economy of God, that is His household stewardship of all things; and He has begun to pivots commodities lower on the debasement of fiat money. On Friday May 30, 2014, The commodity ETFs, DBC, and GSG, pivoted lower on May’s trade lower in the Major World Currencies, DBV, and Emerging Market Currencies, CEW. These are the birth pains of the new normal of destructionism replacing inflationism. Said another way, debt deflation, specifically currency deflation, coming at the hands of the currency traders, on fears that the world’s central banks’ monetary policies have crossed the rubicon of sound monetary policy and have made “money good” investments bad, has pivoted Commodities, DBC, GSG, lower in price, with the result that investors sold investments in Steel Producers, SLX, such as OSN, GSI, X, AKS, NUE, GGB, SID, MTL, PKX, Global Industrial Miners, PICK, such as VALE, RIO, BHP, Coal Miners, KOL, Uranium Miners, URA, and Rare Earth Miners, REMX. Ongoing currency carry trade disinvestment is going to be highly destructive economically. The result of debasement of the world’s currencies will be economic economic destabilization and the much feared economic deflation. Given currency deflation in the Euro, FXE, the British Pound Sterling, FXB, the Swedish Krona, FXS, and the Swiss Franc, FXF, as well as the India Rupe, ICN, and the Brazil Real, BZF, economic growth is impossible. Economic growth was a largely a side benefit, that came from investment gains, flowing from the credit stimulus of Global ZIRP. Economic growth was a function of the investor pursuing investment gain in the bygone era of currencies, and the age of credit. Under the power of the Bow of Economic Sovereignty, that is the Interest Rate on the US Ten Year Note, ^TNX, and its enforcing authority of The Rider on the White Horse, galloping with greater intensity over planet earth, seen in Revelation 6:1-2, the bond vigilantes, not the Fed, has been in control of interest rates beginning in May of 2013, and will continue to be hiking interest rates, and that at a rather quick pace. This inquiring mind asks, just exactly who are the bond vigilantes? It is the Primary Dealers!!! And of note, it is these who hold tremendous amounts of Interest Rate Swaps, literally given to them by the US Fed, as part of an incentive to sell US Debt under POMO. So not only did the Primary Dealers get an a cut on issuing of bonds, they got deferred payment in terms of bets against bonds! Financial Post reports Mohamed El-Erian in Bloomberg News reports “Judging from data provided by the Commodity Futures Trading Commission, the movements in both rates and flows are catching many professional traders by surprise. Despite some recent repositioning, the net short position of non-commercial investors in 10-year Treasuries is the biggest in two years, meaning speculators have made bets designed to profit from an increase in yields and related outflows. Dealers are similarly positioned: Their net short in the largest in almost a year”.